We are small, but perfectly formed! You will find us on the ground floor of the Chelmsford Diocesan Office (53 New Street, close to the station and the town centre). We specialise in Christian books, Church stationery and supplies, cards and gifts, though we can order almost any title in for you. We can also post orders inside and outside the Diocese. 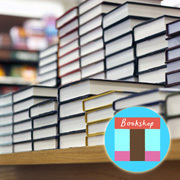 We offer discounts and free books if you are ordering multiple copies of the same title for groups or schools. We will occasionally supply our stock to church bookstalls or special events within the Essex area. We are proud to have one of the last remaining Christian bookshops in the county - please support us.